In our experience, hand-made snare drums and kits from Australia are always a bit special and these are certainly that. Evetts hits the spot with exceptionally hard shells and surpassingly beautiful veneers. Sydney-based Evetts is one of a handful of Aussie boutique companies producing superb hand-made drums. The ace card for these workshops is the availability of hardwoods unique to the Australasian continent. Evetts drums are exclusively distributed in the UK by Drumazon of Cardiff who have furnished us with four stunning snare drums, while pointing out that Evetts also makes full kits to custom order. Like most boutique manufacturers, Evetts relies on outside suppliers for its metal bits. Thus we have tube lugs as standard on all four drums and 2.3mm steel triple-flanged hoops. Additionally, Evetts fits the excellent Trick GS007 multi-step solid aluminium strainer and Puresound brass-end steel wires. All quality fittings, then. But the all-important component is the shell. Evetts uses three staple Australasian hardwoods, two of which are featured here. The arid conditions in Western Australia support the deep-rooted Eucalyptus Marginata, commonly known by its splendid Aboriginal name, jarrah. The sorely-missed Brady company introduced us to super-dense jarrah, which was a revelation. 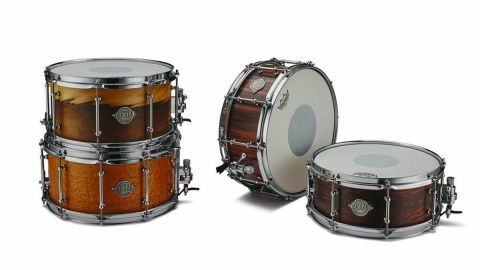 Both the 13"x7" and 14"x7" review drums have 9-ply jarrah shells, the former with a single outer veneer of blackheart sassafras and the latter silky oak. Blackheart is almost unreal - the upper yellow giving way to mid-brown bordered by a jagged flash, which looks as though a graphic designer has been at work. Silky oak is by contrast almost sedate, but is equally beautiful in its understated way. The third drum is based on another Evetts staple: spotted gum - the hardest wood the company uses. Even harder than jarrah, this has a 14"x53/4" 13-ply cross-laminated gum shell with an outer veneer of vertically striped ebony macassar. Finally, the 13"x51⁄2" shell is different again with its 11-ply shell of Queensland walnut and veneer of tiger myrtle. The latter looks faintly synthetic, like the eco-friendly ALPI graphical veneers seen on Sonor and Ludwig drums. Except this is a real veneer with horizontal dark tiger stripes over a rich ruddy base. All four have been sanded and polished till they are smooth as marble. The finish is described as Smooth Satin and really does do justice to these wicked veneers. Drumazon has chosen to import these Exotic edition drums for maximum visual impact, but Evetts is a custom company and can do glosses, stains, fades, bursts and solid paints on request. Check the Evetts website for examples of the range of finishes and woods. All four drums sound fabulous and the differences in the timbres of the various woods is so subtle it’s almost impossible to distinguish between them... but we’ll give it a go. Spotted gum and jarrah are not only exceptionally dense, they are also weatherproof and even resistant to fire, which is heartening to know. Evetts says that spotted gum is the harder of the two woods and has the lower fundamental. Both the jarrah shells and the gum have a superlative clout - indeed, this is what attracted people to the original Brady jarrah snares back in the 1980s. A wood shell with as much cut as a metal shell. The jarrah is said to have a bit more mid-range. This is fantastically subtle and we couldn’t say without owning the drums for some months. What we can say with certainity is that the fourth drum is Queensland walnut and this is a slightly less dense timber, which gives it a tiny bit more warmth. The thing is, the real difference between the drums lies in their dimensions, which overrides and obscures any subtle differences in the wood species. The difference between a 13" and 14" diameter drum always seems greater than it has any right to be! And when you’re used to playing a 14" snare, a 13" can be surprisingly attractive. Just that one inch less infers a huge change in tone and dynamic. The 13"x51⁄2" walnut is so crisp, bright and sharp - it’s really Stewart Copeland snappy. It pops and has the special clarity of ghost strokes, which has you working on your best Benny Greb grooves. The 13"x7" (jarrah) adds tubbiness via its depth but still has a modern ping from that reduced diameter. Thus we fall immediately in love with both 13" drums - which is not to say the 14" drums are any less handy. Just a little more familiar in tuning and application. The 53⁄4" deep spotted gum is a superb all-rounder that tunes up and down with no weak spots, just a sharp character with zip and a fat slapping backbeat. In the end it’s probably down to what is the most useful size for your needs, and frankly which of the gorgeous veneers you like the look of best.